I was delighted to be asked by Mike Linane to be part of the launch for Alison Baillie’s debut novel ‘Sewing the Shadows Together’. It was published by Matador on August 7th 2015. Thank you for asking me to say something about being an English teacher and a writer, as we both are. It’s something I hadn’t really thought about before and it was very interesting to reflect on the topic. Perhaps the first thing to mention is that I didn’t actually write ‘Sewing the Shadows Together’ until I’d stopped teaching, although the idea had been in my head for a very long time. I’ve also noticed at crime-writing festivals that there are very few English teachers on the panels, but lots of journalists, lawyers, soldiers etc. This seems quite odd; shouldn’t there be more of us, because we studied English literature and should be able write? Is there something stopping English teachers from being creative? Speaking personally here, I think perhaps there is. Teaching is so all-encompassing – always something to prepare, or something to mark, or a student with a problem that’s worrying you – that it doesn’t give you much time to let your thoughts and words fly free. I like to clear my mental deck before I begin writing – and when I was teaching this very rarely happened. There are, however, very positive things about teaching and writing. Firstly, you come into contact with all kinds of people and stories. Over the many years I taught I had a window into so many lives, so many families. I haven’t used any of them directly in my novel, but the original idea for it came from the seventies and eighties when I was teaching in Edinburgh secondary schools, including Portobello High. There were several high-profile murder cases at that time and even after the cases had been resolved I couldn’t stop thinking about those who were left behind. How could the parents, the brothers and sisters and the best friends ever get over something like that happening? Young people, the age of the ones I was teaching, scarred by such horrific experiences, which meant that their lives would never be the same again. It was also helpful to my writing that I was teaching great literature and, therefore, had to analyse plot, structure, characterisation and setting with my students. I learnt from the masters that every word mattered, as one sentence could throw light onto a character or foreshadow future events. English teachers also work with students on creative writing, looking at the importance of distinctive voices in dialogue, how a little gesture can give a clue to character, and how a setting can set the mood for a scene. 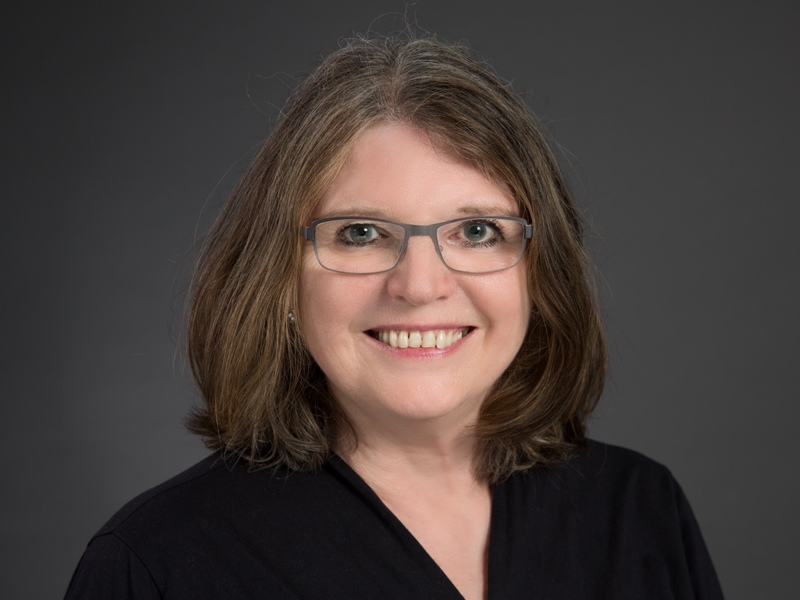 Some of this must rub off onto our writing and certainly a lot of what I instinctively feel works in a novel has been learnt from teaching and my own reading – I love crime fiction, especially Scottish and Scandinavian. An ex-teacher also plays a very significant role in my novel and HJ Kidd is actually based partly (only the nice bits) on an inspirational teacher called Tony Barringer. I was taught by him at Ilkley Grammar School in Yorkshire many years ago. Like HJ Kidd he was only about ten years older than us, loves poetry and is a published poet himself. I can still remember reading ‘Bat’ by DH Lawrence with him when I was about thirteen. That poem made a great impression, and when I started to write my novel it suddenly came back to me – and gave me the classroom flashback, a thematic thread and the title. I am still in contact with Tony, and have given him a copy of the book, but I haven’t heard what he thinks yet! There are obvious other advantages to being an English teacher in that we should have a fairly accurate grasp of spelling and grammar which makes proof-reading easier. On the other hand, I tend to concentrate on details too much and can agonise for ages about the balance of a sentence or word choice, which makes me a very slow writer. Thank you, Linda, for giving me the chance to reflect on this interesting topic – and good luck with your own writing. Thanks Alison! I’ll need the writing luck! 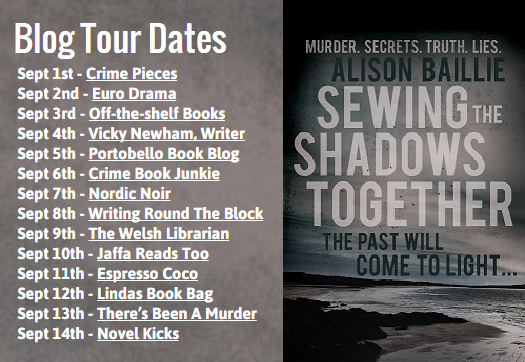 I found Alison’s experiences really echoed my own (I keep in touch with my English teacher too) and I could identify completely with what she said about teaching being so all encompassing so I was interested to see what I thought of her novel ‘Sewing the Shadows Together’. Here’s my review. Returning from South Africa to scatter his mother’s ashes in the Scottish islands, Tom McIver finds himself transported back to the times of his sister’s murder in the late 1970s. When Logan Baird is released from prison, having been wrongly convicted of Shona’s murder, the hunt is on to find the real culprit. I really enjoyed Allison Bailie’s writing as she develops both plot and character in a measured and sophisticated way that draws in the reader. I thoroughly appreciated the fact that the protagonists are more mature so that I could relate to them highly effectively. When Sarah was described as being only 50 I almost cheered. It shows that women can have a past but still be desirable and worthwhile, making a change from the 30 somethings of so many stories. Sarah is portrayed as a complete woman with hopes and desires, fears and flaws, making her wholly believable. I also have to admit to being slightly in love with Tom myself. The plot is crafted so that the reader is kept guessing throughout and I kept changing my mind about who I thought was the real murderer. Hints are dropped and the flashback dreams help build a convincing and chilling backstory that engages the reader fully. However, this is not just a one thread story and there are side issues to satisfy the most demanding of readers, such as family relationships, adultery and attitudes to those who do not conform to social norms. I think I also enjoyed reading ‘Sewing the Shadows Together’ so much as I was in South Africa where it is partly set as I read. I found there was a real sense of place and time. In the Scottish setting I could hear those Bay City Rollers’ songs in my head and the descriptions of the Portobello area really helped paint a picture in my mind’s eye. The iterative image of shadowiness – the references to Lawrence’s ‘Bat’ and the mercurial nature of memory – build the tension and lead the reader into wanting to read on and discover just who did murder Shona. ‘Sewing the Shadows Together’ is a totally satisfying read. 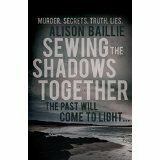 Alison Baillie builds and builds tension to a rather surprising climax. This is a thriller well worth the read and I can’t recommend it highly enough.